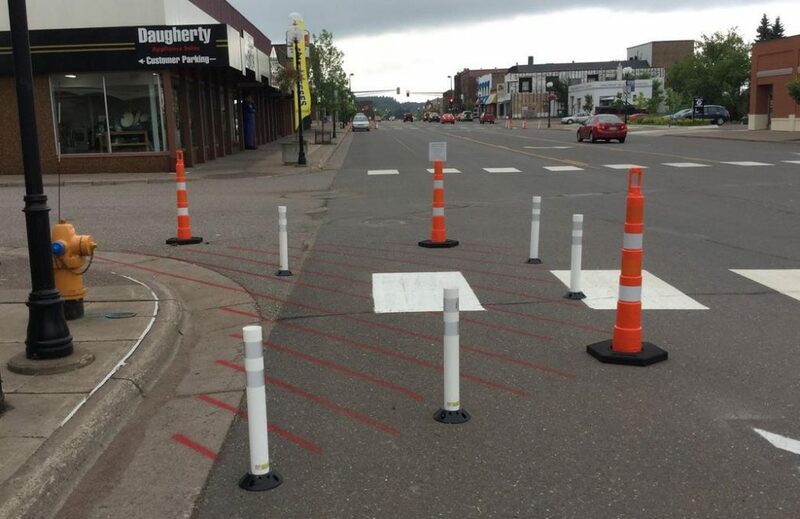 Bike lanes, sharrows and bump-outs became a reality in Cloquet through an Active Places Demonstration Project Grant from BlueCross and Blue Shield’s Center for Prevention. This funding ($5,000) was leveraged through Statewide Health Improvement Partnership (SHIP) work in Cloquet. The Active Transportation Coalition in Cloquet has been active since 2012 and helped to prioritize the project in hopes to lead to long-term infrastructure changes on Cloquet’s roads. Over the course of three years, past funding expectations, the City of Cloquet chose different streets and intersections to try out bike lanes, sharrows and bump-outs to see what might lead to the most effective long-term changes. The “Active Streets Demonstration Projects” were put out for about 2-3 months during the summer months and a community survey was available for residents and visitors to give feedback. The length the projects were up gave people time to understand the benefits and issues associated with them which led to thoughtful feedback and planning for future projects. In addition to residents and visitors, the Cloquet City Council and local businesses also had time to get used to some of the changes, so when planning for Cloquet Avenue came around, there was no question when bike lanes and bump outs were added to the one mile project, scheduled for summer 2018. Bike lanes were added the full one mile length of the main thoroughfare, and bump-outs were added at five main intersections. This project is an example of true culture change through persistent, sustained hard work and value of all modes of transportation!